See what our customers are saying about us below! We have been using Hill-Air’s Maintenance Program for about 10 years. Every time I’m impressed with the professionalism; not just from the workers that do the work at our home, but from the individuals that take my phone calls to schedule our appointments, and those individuals that call to let us know they are on their way to our home. The maintenance program must work too. We had only one issue over the ten years and they were quick to respond and got the house back to a comfortable temperature. Thank You Hill-Air! Can we use your full name if we publish your review? As with many/most companies, I fully expected to find something to be critical and/or complain about, however I DID NOT. Everything about this company is first-class. From the Sales Rep – Jeff Becker – to the installers to the service technicians. And also to the quality of the equipment. There was a glitch initially with the thermostat and the tech was out immediately and replaced it and made sure I had no questions about it, and even helped me set the programming. There was one other minor problem that was handled immediately and efficiently. And ALL the personnel that I came across were courteous and professional. Any questions I had were answered immediately to my satisfaction. Even all their trucks were very clean. I honestly can’t think of anything of which to be critical. Hat’s off to Scott Hill for a great company, a rarity today, and appreciated. I would like to thank everyone that worked with me at hill-air very professional from start to finish. Would highly recommend. Chris did the excellent work I have come to expect from him. He answered all my questions regarding how I should proceed as my HVAC unit ages. I have been doing business with Hill Air for many years and have never been dissatisfied. I was originally referred by another happy customer. They are excellent! Always CLEAN, wearing shoe covers, friendly, well-informed, offering superb customer service, including the office staff. Thanks Billy N. for taking care of everything for me. 3. Professional ..asks if any questions explains what he did. We have been using Hill-Air for our HVAC needs for many years. Not a complaint! Workers are all very polite and knowledgeable. The furnace in my home completely died on January evening 2018 and I woke up to a house that was a chilly 56 degrees. Bruce came out that day and we discussed the different furnace models. The new Carrier furnace was installed quickly and Ron did a great job with the installation. The new furnace is awesome! My home is much more comfortable and there is no longer a drafty feeling. (old furnace lasted 34 years and was also installed by Hill-Air). Hill-Air also installed a new AC unit in August of 2016 that has made a difference in the humid summer months. I highly recommend Hill-Air for their product, customer service, and reliability. Want to thank Bruce for coming over 1/24/18 and checking out my furnace and picking out the new furnace for my home. He picked the right furnace for my home and having the installers come over on 1/25/18. Steve and Ron were the tech’s that came over and installed the new furnace for me. they did an excellent job installing my new furnace for me. They cleaned up everything before leaving and explained how the new furnace works. I have been a long customer with Hill-Air and will continue to use Hill-Air. I give Hill-Air an A+ for a job well done. If you need a reference you can use my name. Once again thank you very much on a job well done. They came over for our winter maintenance and as always were prompt, courteous and professional. We have used Hill-Air for many years and we’ve always been pleased with how nice both the scheduling offices and field techs are. They have gone above and beyond at times to solve problems whether it be summer or winter at our house. Although they have a lot of customers to service, we never feel like we are just another house. Thank you for the wonderful service! I think the thing that stood out most was that if the problem was not fixed, (which is it was, Billy was spot on), that Hill-Air will come back out within 30 days at no additional charge to review the problem, re-diagnose and repair. Billy was fantastic! He came out on New Year’s eve when our furnace stopped working. The error code on the unit was not familiar and he took the extra time to research the problem, even calling the manufacturer to make sure he correctly fixed the issue. He was great!! We have had nothing but great service on our heating and air conditioning unit since it was installed back in 1998. Your representatives are always available to answer questions about my furnace, air conditioning and even my humidifier. Great job every time! The technician was very professional, courteous, polite, and informational. I would recommend Hill Air to anyone!! Billy arrived right on time, was courteous and informative. Performed the maintenance to our furnace and humidifier as planned and went above and beyond to fix the cover on our filter housing. Great customer service! Thank You! I am the first time new home owner and it is nice to see the service technician will take time to go over the complete system and test all the safety devices to verify it will work correctly for the complete season. It is nice to see that he questioned all the system; just because it is relatively new he still tested it all. A very customer-centric company. Polite, clean, professional team provided a great experience from beginning to end. We needed a new HVAC system in our home. Bruce S. came out to measure and inspect the home, and provided a number of options at various price points. He was very knowledgeable and helped guide us in our decision. The installation was scheduled quickly and easily. The crew that did the installation was polite, tidy and thorough. They put drop cloths throughout the house, and took great care in both the removal of the old system and the installation of the new. No wall scraps or dents. The installation looks great, and the system works even better. I would highly recommend Hill-Air! I have been dealing with Hill-Air for over 15 years and have been completely satisfied with their service. About 15 years ago, I had gone out to dinner with friends the night before I was to fly to Florida and when I arrived home my house was freezing cold. 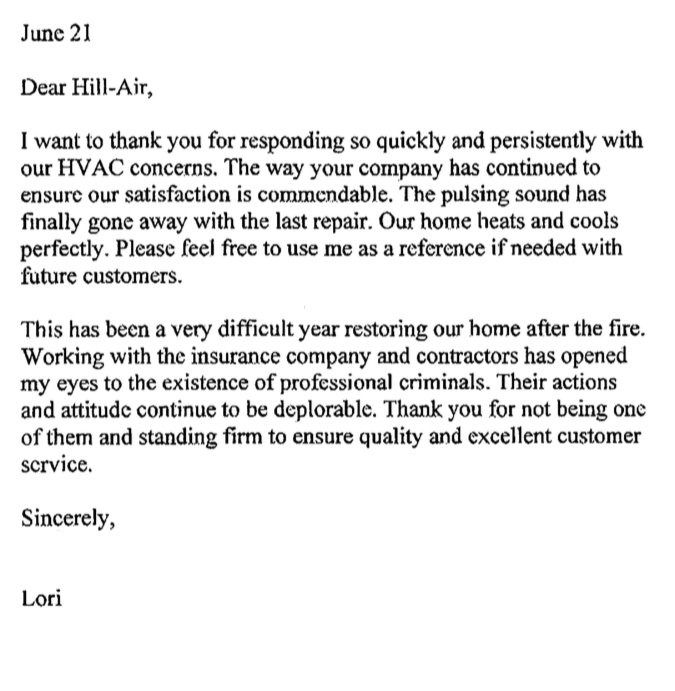 Hill-Air was the only company that answered my call and repaired my furnace that night. Needless to say they are the only company I will deal with. Chris just left and he was awesome. We built our home 4 years ago and Hill-Air installed our system. This is the 1st time we signed up for the maintenance program and we’re glad we did, because we learned a lot that we didn’t know. One adjustment alone is going to save us 19% on gas usage. We learned that we need to flush the trap out on the condensate line periodically as well as change the humidifier filter regularly. It was nice that Chris took the time to explain all these things, which we’re going to benefit from with longer lasting equipment. Thanks a bunch Chris! Always get excellent service especially from Chris K.
This was our winter check up for our new furnace. The technician gave us a few tips on things we weren’t aware of and was very efficient. We are happy with all the services we have received through the years and recommend you to anyone we know who needs your services. The install was great, the employee was professional and very helpful. I called after hours on a weekday and left a message with the answering service. A little before 8 A.M. (their opening time) I received a call to schedule service. They met my request for same-day service and agreed to a call-ahead so that I could leave work to meet the tech at home. The tech called and told me when he expected to be there. I got home about five minutes before he got there, so our time estimates were accurate! He analyzed the problem and performed the repair in a timely manner. I also signed up for the preventive maintenance (I had it before with Hudson, but let it lapse when I moved). Very satisfied with the experience. I have been using Hill Air since 2003. I do the preventative maintenance twice a year. They have also met my needs with an humidifier, air cleaner and our most recent purchase of a new air conditioning compressor. The technicians are professional and really know their product well. Scott at Hill Air went above and beyond to resolve a service issue to my satisfaction. Mark took time to diagnose the cooling problem accurately and fix it. 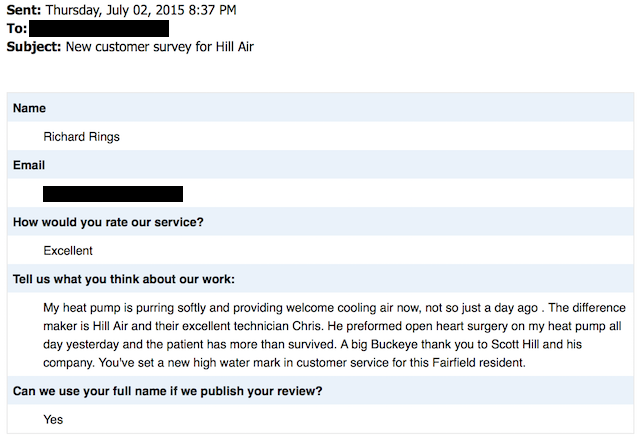 We now have a wonderfully cool home Hill Air has given me A+ customer service. Also, I normally do not purchase a preventive maintenance plan but Hill Air offers a choice of plans. For me, the Premium plan was well worth the cost. We moved to a new house and they came out and did a routine check and they explained how the furnace and thermostat worked even though they did not install. They were very knowledgeable and we did not feel rushed. They really wanted to make sure we were 100% satisfied before they left. Technicians are always on time and efficient with their work. Feel very comfortable with our check-ups twice a year. Have been with your maintenance program since 2014, and have found every serviceman very helpful and respectful. Very kind people to work with and thorough to help with questions. The unit is much quieter than our old unit. Thank you Hill-Air! We are on the maintenance plan with Hill-Air. 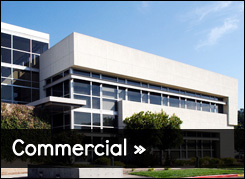 Every 6 months there is a scheduled visit where the unit is cleaned, evaluated, and serviced. It is peace of mind knowing our furnace/AC unit has this regular maintenance record on file with Hill-Air. The service is always excellent. Always on time and very considerate. They were very professional and clean! Couldn’t have had a better team come out and do our air! Way better than other companies and so nice ! Total pros. We will not trust our home air system to anyone else! Very prompt, knowledgeable technicians, who are also very personable and take pride in their work. The service reminder is very handy to make sure we keep our HVAC system in tip-top shape. Responsive, on time, and efficient. 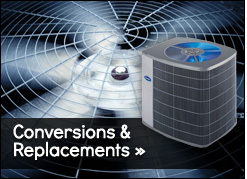 Chris K very friendly and very professional when repairing the A/C unit. Affordable, knowledgeable, HONEST service. Prompt & courteous service representatives and office staff is friendly and easy to work with as well. So refreshing – so pleased! I came home from a long day to find a hot house and water puddling under the furnace . The moisture was actually dripping from the AC down the side of the unit. This was just before the end of the business day, but I phoned HillAir, and explained the trouble. I was hoping for an appointment for the next day, and was extremely relieved when told that a truck would be there within the hour! Fortunately, one of their technicians was finishing another call in the area and came quickly. He identified the problem and took the necessary steps to fix it. It took more than an hour and a half for the job to be completed. We really appreciated the patience and positive attitude that the staff person displayed as he worked through the repair. Talk about going above and beyond! We’re grateful that HillAir goes the extra distance and that its excellent staff and technicians will work after hours to be sure that our HVAC needs are met. We recommend this fine company to everyone who wants quality service. Had us up and running quickly and did a great job! Bonus, he was also funny. Thanks! Awesome! Hands together for our technician (Chris). He was prompt and found the problem with our non working A/C unit in our business office right away and replaced the part and had us up and running in minutes after his arrival! Great job Chris! we appreciate it in this hot humid weather to have our A/C back on in the office. What more could anyone want? Chris arrived on Sunday when he said he would be here. He identified the problem with our air conditioning outdoor unit and repaired it quickly, which is extremely important to our family in this, the hottest part of the summer. Hill-Air installed a new Carrier Air Conditioner and Furnace in our home on July 17, 2017. We selected Hill-Air to install our new system based on the excellent preventive service we have received from them over the past several years. Their Comfort Advisor did an excellent job of putting together a proposal with three options to meet our needs. He presented the information on each option and we were able to make a informed decision. The installation was scheduled and completed with no delays or problems. The two technicians who performed the installation were skilled, methodical, and meticulous, and the result was an A-Plus installation with no problems, and a very pleased and satisfied customer. THANKS TO ALL FOR THE FOR A GREAT JOB! 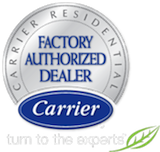 Hill-Air installed the original Carrier system for the home builder, and for years I had Hill-Air perform the annual winter/spring services. That original unit lasted 22-23 years. Still operating without problems, I took advantage of an off-season Carrier special and replaced the entire system and still have Hill-Air do what they do, twice a year. It was one of my wiser investments. Service people are always pleasant, prompt, courteous and careful. The overall system is excellent. Service above and beyond. Talked to Bruce on the 4th of July, when a/c was completely out. He just happened to be in the office in the AM, saw my message and called right away-even offered to run out a temporary cooling unit to get us thru the holiday. We declined, but he was out the following day, showing us the available units. We arranged for installation and the system was up and running in 2 days. Everyone is professional, personable and top notch. 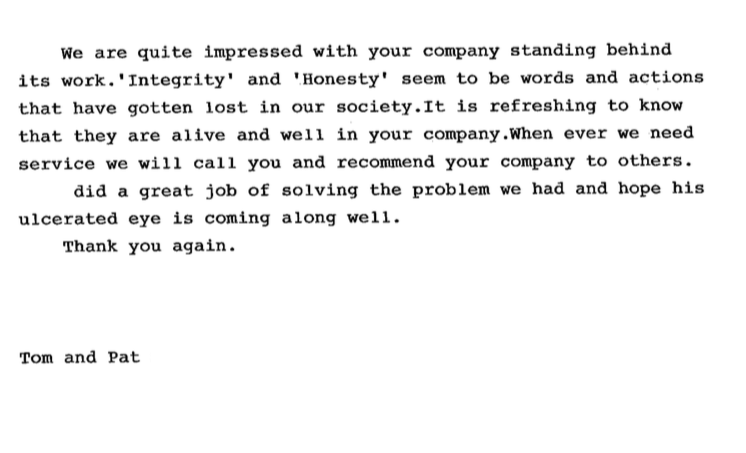 I will always recommend your company. Although we do not want anything to go wrong, I’ll call Hill-Air first from here on out. The recent installation in my home was done very professionally. Their staff is very knowledgeable and courteous. They laid drop cloths from the door they came in and out of clear through to the basement where the work was being performed to keep my home clean. When they were finished they cleaned up the area very well. The system was then explained to me to make sure I understood the different components and they answered any questions I had. Due to the length of time I have been in my home, this is the second system they have installed for me. Their service is as excellent today as it was when the first system was installed. 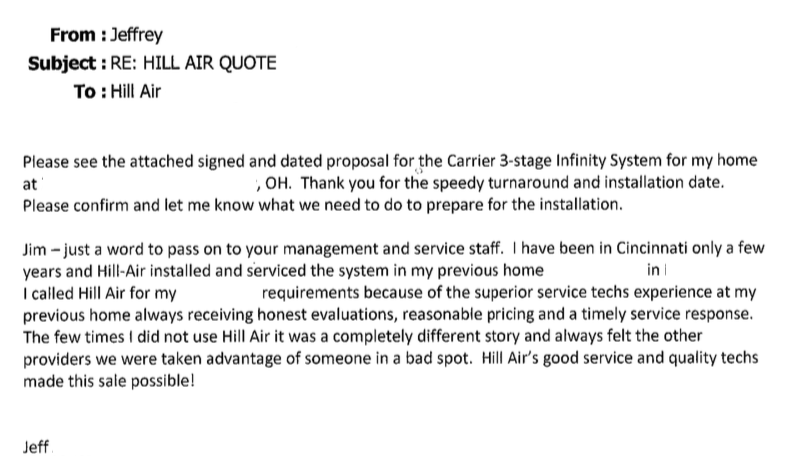 I would definitely recommend Hill-Air for service to your existing system or installation of a new system. Thank you. The installers showed up on time, were friendly and professional and performed excellent work. I had my home A/C replaced June 19, 2017. Hill-Air scheduled the replacement after verifying the size of unit that I needed — they didn’t assume what I had and was no longer working was the correct size. The install technicians showed up on time and finished in about 5 hours — they were considerate of my home and removed the old unit prior to departing my home. All my questions were answered and I received the operation manual plus explanations of some key upgrades on this unit over my 14-year old unit that was replaced. The technicians were courteous and professional. I highly recommend Hill-Air to family and friends. The installers were very knowledgeable and answered all our questions. They were quick and cleaned up after the installation. The air conditioner is great and cools the whole house, as described by the salesman, prior to the installation. We were very pleased with Hill Air and would recommend them to all. Have been a customer for about 18 years. They put our original AC and furnace in 18 yrs ago and just installed the new Carrier AC and furnace a couple of weeks ago. We have always taken the Maintenance Agreement. Thanks to Chris, we got our A/C back on-line within a couple of hours after calling Hill-Air, because Chris stopped by on his way to another job which was just beyond where our house is located. Chris found the problem within a couple minutes, had everything he needed to fix it, and has us back on-line much quicker than expected. Chris has scheduled someone to come and set-up a time to replace our 22-year-old-plus-unit, which has lasted longer than normal due to the regular check-ups by Hill-Air maintenance people for the past several years. Our thanks to everyone at Hill-Air for the great job they have done in keeping our furnace and A/C in great working order. This was the first problem in 22-years-plus! Again Thanks to all of you at Hill-Air. The work was excellent. Your employee was very courteous. My husband and I came home to no air conditioning after 5:30 pm on a Thursday. Within an hour of calling, the technician arrived at our home and had our air conditioner running again. He was both knowledgeable and professional – and explained what caused the unit to stop running and why. Very thankful for the fast service! 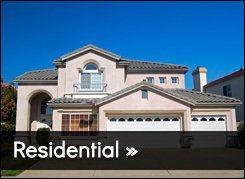 Hill-Air Heating and Air is the company to call if you want excellent care and service for your home’s HVAC system. They installed the furnace and air conditioner when our house was built and have maintained it since then. We have a Preventive Maintenance Contract with them and that spring and fall checkup gives us peace of mind. Recently, our air conditioner had to be replaced. Hill-Air scheduled the installation date quickly and, in addition, took care of the unit’s registration and warranty, paperwork, permits, fees and all details for the job. They are always available to answer questions and we have complete confidence in them. This project went much smoother than I expected. The guys went right to work and didn’t stop until they finished. Removed the old and installed the new system in 7 hours!!!! Guys were very professional and polite. Did not leave a mess and explained things thoroughly. I was especially impressed with Bruce. When he first came to my home he explained all my options in detail. 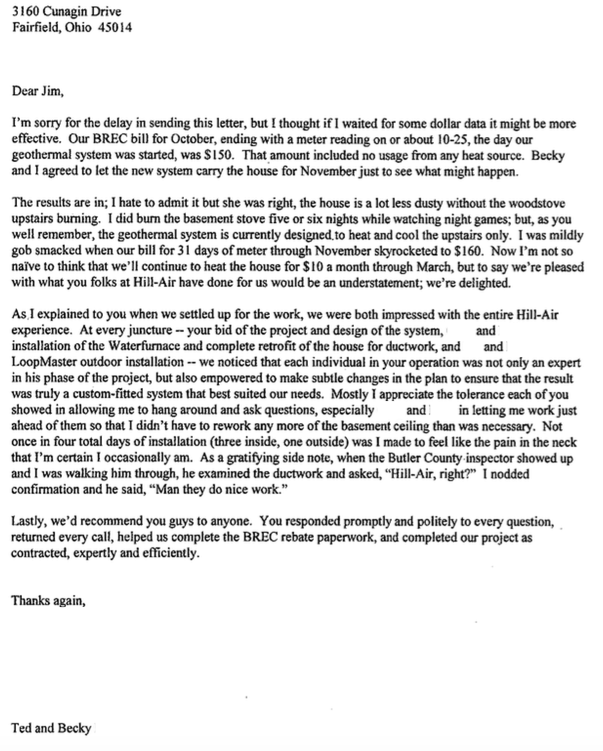 I felt comfortable and assured that Hill Air was the right company to do the job for me. And the price was very reasonable. I would recommend Hill Air to anyone who needs to replace or upgrade their home heating and air system. The technician was very professional and courteous. He give me a very good overview of the services and warranty information and made other recommendations regarding the system that I found helpful. Nothing worse than having your air conditioning go in the hot summer months. We had used Hill-Air to service our unit before so we called and they came over very quickly to check out our unit and give us a quote on replacing it. I did my research and compared against other companies and checked out friends recommendations, Hill-Air gave us the best deal and the best unit. We could not be any happier with them and the service they provided. The installation guys were great. They cleaned up after the job . Hats off to Bruce for taking the time and answering all our questions in regard to getting the new unit installed.. The technician, Mark was prompt and courteous. He was knowledgeable about the system and what it would take to get it working again. I would certainly refer others to your company. Billy was a very courteous and informative service representative. He explained what the steps he was going through to service our air conditioner, and provided options and costs along with pros and cons for each. Never did he pressure us to make a decision one way or the other, but offered informative choices instead. Mark was helpful and honest. We had Hill-Air install a bathroom fan last Wednesday, 5/24, and they did an excellent job! Don and Kevin were the installers and they were very professional, very knowledgeable, very thorough, and very neat. I would highly recommend Hill-Air to anyone needing their services! At the recommendation of my mother, I called Hill Air Heating and Air Conditioning to perform my summer preparation checkup and filter change. I loved that I was able to get a 5pm-7pm call so I didn’t have to take off work for the appointment. Billy, Indoor Comfort Service Expert, was friendly, quick but thorough, and clean. Definitely, recommend! Chris performed our A/C annual maintenance on 5/22/17 and did a excellent job of keeping me informed on what he was doing, and the benefits of the annual maintenance service. We have total confidence in all of your Technicians who have serviced our units over the years. Thanks to all. The gentleman that serviced our furnace and air-conditioning did an excellent job! He was courteous and very knowledgeable. Answered all of my questions. Chris came out to look at why my air was not working. Being a newly installed system last winter, the air was not turned on. Chris showed me what the issue was and answered my questions about operating the heating/air system. Being a first time homeowner, the tips he shared are invaluable. Going to sign up for maintenance program so that I will get a longer life out of my system. Also, interested in a humidifier and attic vent. Great recommendations by Chris. Thanks Chris & Hill-Air! We have been using Hill-Air Heating & Air Conditioning for our home since June of 2001 and are very happy with their equipment and service provided by their technicians. For the past few years Chris Shank has been our technician for bi-annual cleaning and system check-ups. Chris is always on time, very thorough, professional and leaves the work area clean afterwards. If necessary updates are needed he explains the pros and cons of the replacement parts or equipment. I would highly recommend using Hill-Air for your heating and cooling needs. You always do a good job, and our furnace has lasted for 16 winters so far! I appreciate that your repairman did not suggest I need a new furnace like one gentleman did from another company. That was about 4 years ago! Your repairman has always been very helpful and even replaced the air filter for us, which was next to the furnace (my husband isn’t good about taking care of that!) He is also very friendly. Your price is higher, but it is worth the extra money to feel confident that you are doing a good job maintaining our gas furnace and AC unit. They were on time, did nice neat work, clean and explained everything to us. Completed my new AC installation in a very professional and timely manner. Technicians were very courteous, friendly, and polite. I am extremely pleased with the entire experience, starting with the sale all the way through the installation. Our service specialist, Vandon Smith, was very neat, clean, efficient, and professional. He even noticed that our new system, purchased last July had not been registered. He took the time to register it and showed us how to use it. This should have been done when the system was installed. He was very knowledgeable about the system. Prompt, courteous, professional and thorough. Hill Air installed my HVAC system 10 years ago when I purchased my new home. I have been using the yearly maintenance system all these years. You have provided me with excellent maintenance especially when Chris Kellum provides the service. Top notch technicians, thorough, friendly, and on-time. I have used Hill Air for several years for new construction and annual maintenance. 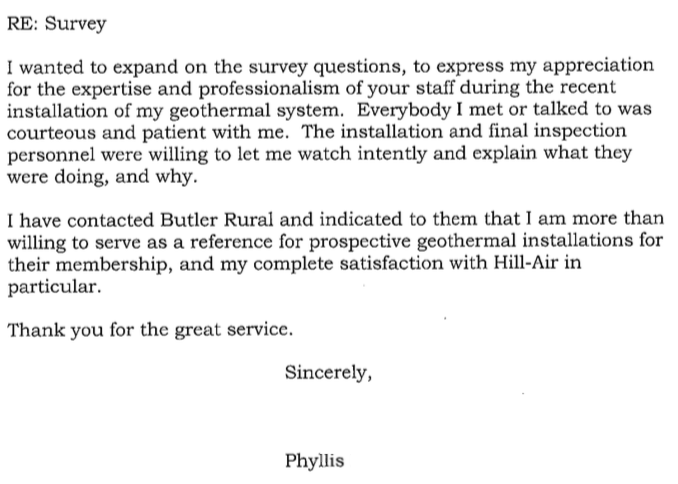 We are very happy with the consistently excellent and dependable service we receive when working with Hill-Air employees. We like that your employees are long term and that we see the same people year after year. Everyone is professional, competent, neat and efficient. When you had to reschedule an appointment you even thanked us for understanding and sent us a coupon. This really is above and beyond. Thank you for your excellent work. See you next season! The service person was so helpful and went over the instructions of our new system. Explained many things we didn’t know…made us more confident in our new heating system. The technician arrived on time even a few minutes early. He wore foot protectors while in my home. He explained everything he did and was very courteous and helpful. I always receive top notch service from Hill Air. DON, THE SERVICEMAN, WAS VERY PERSONABLE, HELPFUL, EXPERIENCED, THOROUGH. When i moved into this house the former owners had used Hill-Air, and I continued to use them for the last 10 years for my seasonal checkups. When I needed a new HVAC system I again turned to Hill-Air. I highly recommend them. They are honest, professional, and always do a great job. We have been using Hill-Air for over 25 years. They have never once missed an appointment or been late. The employees are highly trained and professional. We can’t say enough good things about Hill-Air! Justin did a great job. He arrived on time and was very friendly. Got the job done in a timely and clean manner. As usual, great professional service from Hill-Air. Hill air is the best! Good people, good prices, and lots of options. We had our summer PM yesterday. The technician (Vandon) was extremely thorough in his work. On the evening of Dec 2, 2016, Chris K. from Hill-Air arrived at my residence for a heating checkup. His work was very professional. Everything that needed to be checked was checked. I needed to have a capacitor replaced on this job and it was accomplished. 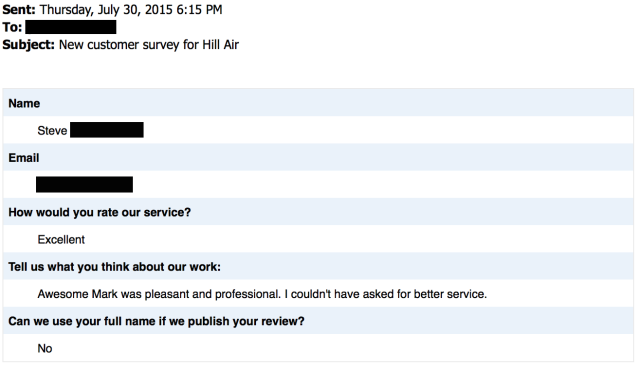 I have dealt with Hill-Air for many years and would recommend their services to anyway. Thanks again! I would like to say Kudos to the service team that came out and installed my new furnace this past October. They were very professional the entire time they were at my home. After the installation and inspections, the technician took his time to educate me about my new unit. I would recommend Hill-Air to all of my friends. Thanks again! It was a totally painless experience. Bruce came out as a true professional to help us select the proper unit. The installers were very knowable and respectful to us as their client. The work was completed in the time given to us. This day and time good contractors are hard to find. Billy, did a great job responding immediately and checking out the AC unit. Billy explained all the services which are available and presented options in a non pressing manner. Various options were discussed and Billy was knowledgeable in providing information for future product needs. A big thanks to Bruce Sibert and Crew for an excellent customer service experience! We couldn’t be happier with our new Carrier HVAC installation and look forward to continuing our relationship with Hill-Air. No buyer’s remorse here!! The most important thing is that the technicians know their job; that they are also experienced or have the ability to do expert work. And when someone knows exactly what to do, as with my problem, he will do the job in the allotted time allowed for the service trip and for the problem. I was impressed that our service technician knew exactly what to do in so little time. I almost felt like this was probably not the problem since he serviced our A/C so quickly. However, I was very happy. And I was so relieved it wasn’t something that was going to be a major expense. After all, the unit and furnace is now ten years old. They stand behind the warranty for parts and labor too. So glad we called Hill Air. Our air conditioning went out on Sunday July 10th and we called and told them what was happening. They had Bob Knepper call us and he came out within a two hour window. He had our air conditioner up and running within the hour. Very professional and caring gentleman. We would recommend Hill Air to anyone who wanted or needed this type of service. Thank you so much we so appreciate what you do and how you do it. I just wanted to thank [your service tech]. He came out on Monday 10/13 to do my fall maintenance. I have a new system that was put in this summer, and he patiently went over everything with me again–including the programmable thermostat which I did not yet have the hang of. I really appreciate him going the extra mile during his visit. As always, Hill-Air had wonderful service. I am glad I decided to go with you guys again for my replacement HVAC. THANK YOU! On 2/26 [your service tech] responded to my home to service the AC unit. I found him highly professional, outgoing, and very informative as he performed his work. [Your service tech] is a credible and trustworthy individual who represented your company in an outstanding manner.